Khan Academy is a website features thousands of instructional videos on a variety of education subjects including math, science, and history. Developed by Sal Khan, the project started as YouTube-based tutorials for Sal's younger relatives living in a different state. The videos feature whiteboard-style drawings using a Wacom tablet and voice-over by Sal. 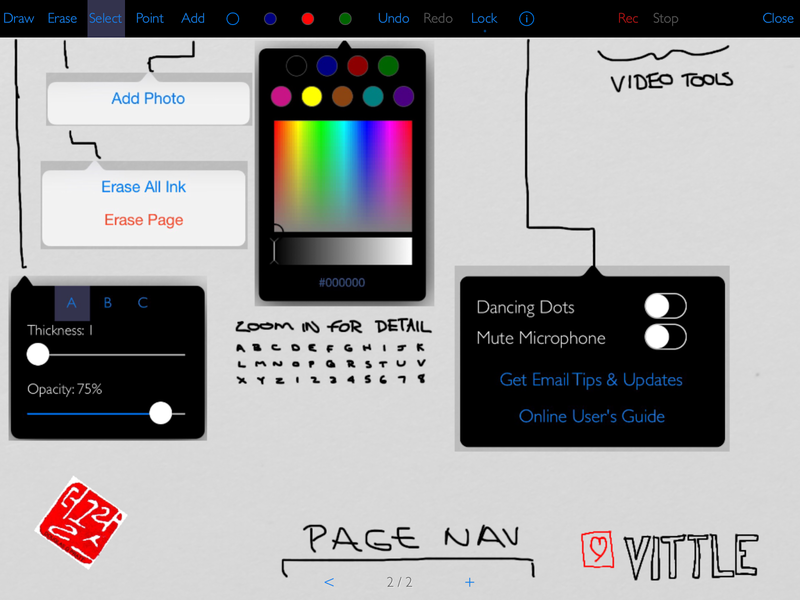 There are a number of apps for the iPad and other tablets that record both drawing and narration. One of my favorites is the app that I am reviewing in this post - Vittle. As you can see from the screen capture below, the layout of Vittle is lean with a panel of options across the top and paging at the bottom. The screen capture displays the settings available with each option. In addition to the whiteboard functionality, you can also import PDF presentations from Keynote, DropBox, and e-mail. Once imported you can annotate on top of the presentation. Vittle records each video as a scene, so you don't have to record an entire presentation in one take. Once scenes have been recorded, you have the ability to delete unwanted scenes and reorder scenes. When ready, you can save the video to the camera roll for additional editing in iMovie or for upload to the video platform of your choice. Some video recording apps require you to use their servers to house your videos. I prefer to have mine saved to the camera roll for both control and the flexibility to do additional editing, and Vittle lets me do this. Although the iPad is designed to draw with your fingers, I prefer using a stylus when using whiteboard and drawing apps. Lots of stylus choices are out there, but I prefer the Griffin "Stylus for iPad and Capacitive Touchscreens" available for $14.99. Below is the video I created using Vittle. If you found this helpful, please comment below and share on Facebook. If you download Vittle, let me know how it works for you. What have been your experiences with whiteboard recording apps?